See also the the Gallery, Continuo, Choir Room, and Tower. St. Thomas Protestant Episcopal Church was established in 1823. Its first church building, located at Broadway and Houston Street, was designed by Joseph R. Brady and the Rev. John McVickar and opened in 1826. Two octagonal towers anchored the corners of the Gothic Revival facade. This first church was destroyed by fire on March 2, 1851. A second church was built on the same site in 1851-52, and the parish remained until 1870 when they moved to their present location on Fifth Avenue and 53rd Street. The third church was built from 1865 to 1870 to the designs of Richard Upjohn and his son, Richard M. Upjohn. A massive tower, soaring 260 feet into the sky, was its most prominent feature. This church, nestled among the many gilded mansions of Fifth Avenue, was the scene of many society weddings and funerals. A tradition began on Easter Day where the wealthy parishioners processed to nearby St. Luke's Hospital, bearing gifts of food and presents for the needy. Today, the annual event continues as the Fifth Avenue Easter Parade. Tragically, the beautiful church burned to the ground in 1905, leaving only the tower standing. The fourth and present St. Thomas Church was built from 1911 to 1916, and designed by a partnership of Ralph Adams Cram and Bertram Grosvenor Goodhue. Lee Lawrie executed the many sculptures and decorations, most notably the 60 figures of the magnificent reredos which is 80 feet high. Music has long been an important component of worship and liturgy at St. Thomas Church, and is supported by the St. Thomas Choir School, founded in 1919. In late July 2014, St. Thomas Church announced that Dobson Pipe Organ Builders, Ltd., of Lake City, Iowa, had been commissioned to build a new organ for the chancel. Planning for the new instrument began in Spring of 2008, and later that same year Dobson was selected as the intended builder. The four-manual instrument, to be named "The Miller-Scott Chancel Organ," was underwritten by Irene D. and William R. Miller, and is in memory of Dr. John Scott. It has been designed to support choir, congregation and repertoire in fair balance. Dobson will retain the existing 1913 organ case, designed by Bertram Goodhue, which will be fitted with new, speaking façade pipes. Behind this case will be the Swell, Choir, Solo and Pedal divisions. On the opposite (south) side of the chancel will be a new second case of complementary design, enriched with significant carvings from Dennis Collier Sr. and Jr., and housing the Great and Positive divisions. The elaborately carved console shell, originally built for the 1913 Skinner organ, will be conserved and fitted with new components. Ten stops from the existing organ will be retained, refashioned to suit the new scheme. The Great Organ of St. Thomas Church Fifth Avenue was originally built by the Ernest M. Skinner Company of Boston as their Opus 205 in 1913. In 1956, the organ was extensively revised and rebuilt by the Aeolian-Skinner Company as Opus 205-A under the direction of G. Donald Harrison. Subsequent revisions were completed in 1969 by Gilbert F. Adams, and in the early 1980s by Mann & Trupiano. Except for the Trompette en Chamade, which was located under the rose window over the Fifth Avenue entrance, the entire instrument is in the chancel, with the Swell and Grand Choeur in the main case at the right on the north wall (liturgical south) and the exposed Great to the left, with Pedal reeds behind. The Vorwerk and Pedal upperwork are exposed on the south wall, in front of the Positif and large Pedal flues. The organ was removed in June 2016 in preparation for the installation of the Dobson organ. In the 1960s, the nearby Museum of Modern Art began an expansion program and built a large addition adjacent to the chancel of St. Thomas Church. Blasting damaged the reredos and caused part of the ceiling in the organ chambers to come down. A clogged drain on the roof caused a leak in the Swell chamber. Some of the rebuilt Skinner chests had developed dead notes and ciphers. Aeolian-Skinner was contacted to clean the organ, address the mechanical problems which had arisen, and to effect desired tonal changes. The company could not undertake the work, but recommended that arrangements be made with Gilbert Adams and Anthony Bufano, Aeolian-Skinner employees who had recently begun organ maintenance work in New York City. Adams and Bufano made some of the temporary repairs, and tonal revisions were completed in a small shop set up in the church basement. Although Adams and Bufano set up separate businesses, Adams continued at St. Thomas Church, assisted by Robert James. Rebuilt Skinner chests were replaced with slider chests. Tonal work by Adams included the replacement of revoiced Skinner reeds with brilliant French reeds, and the revoicing or replacement of mixtures. The enclosed section of the Positif (Choir) was unenclosed and renamed Vorwerk, but soft stops were retained for accompanying purposes. The Antiphonal Organ, which had preparations for a separate two-manual console in the rear gallery, was connected to a one-manual keyboard in the interim by Adams. A parishioner of the church, who had long expressed a desire to give the Antiphonal console in memory of his mother, offered to give a separate organ for the gallery. The Antiphonal Organ was removed and much of it was incorporated into the chancel divisions in preparation for the installation of a new four-manual mechanical action organ to be built by Mr. Adams. He [William Self] said that about the time the rebuild was announced, old EMS, in his late '80's, came to him and asked if Self would hold off on the proposed work until EMS was dead. Self refused. Then EMS asked Self to store the pipes for his organ in the church basement, on the condition that if the new organ was not up to Self's hope, EMS would return and re-install his old organ. Ernest Skinner next wrote a letter, dated October 7, 1955, to the Rev. Frederick M. Morris, rector of the church. Skinner explained that he was the builder of the original organ in St. Thomas Church, imploring, "If it happens that your good people do not like the organ after its rebuilding and I suppose revoicing, and wish to remake it, to be more as it was originally I will be glad to restore it at the lowest possible cost, which implies no sacrifice or compromise whatever." As a postscript, Skinner wrote, "I received word that Mr. Candlyn, your former organist, became what might be termed grief stricken, when he heard that organ was to be done over. . ."
Despite Mr. Skinner's pleas, Aeolian-Skinner proceeded to rebuild the organ, hurrying to complete it as much as possible before the opening recital on June 26, 1956, of the National Convention of the American Guild of Organists. Pierre Cochereau, titulaire organist of the Cathedral of Notre Dame in Paris, had been selected to play that first recital on the new organ, and it was also his first tour in the United States and his first recital in New York City. As the convention date neared, Mr. Harrison began to show signs of strain exacerbated by working in an un-air conditioned church during exceptionally hot weather. He suffered from angina complicated by a hiatus hernia, and had been taking nitroglycerin tablets. On Thursday evening, June 14, Harrison walked eight blocks in the sweltering heat to his apartment at 1019 Third Avenue (near East 60th Street), unable to get a taxi due to a subway strike. At 11:00 pm that evening, he had a massive heart attack and died before medical assistance could be provided. He was 67 years old. The next morning, Joseph Whiteford, Vice President of Aeolian-Skinner, called Mr. Self to inform him of Mr. Harrison's sudden death. After hearing the grim news later that day from Mr. Self, the Aeolian-Skinner crew agreed that the greatest tribute to Harrison would be to get the organ as nearly complete as possible for the AGO Convention. Although the gallery organ was left unfinished, and a number of stops had not yet been regulated or tuned, the organ could be used for Cochereau's recital, attended by 1,200 on June 26. Many organists considered Harrison's rebuild of the Skinner organ to be his masterpiece, although it would be drastically revised in the years to follow. At the request of Dr. T. Frederick H. Candlyn, organist and choirmaster, the 1913 Skinner Organ was further revised in 1948 by the M.P. Möller Company of Hagerstown, Md. This contract was undoubtedly given to Möller after Dr. Candlyn was extremely disappointed in work recently entrusted to Ernest M. Skinner, who was by then in his 80s. "Dr. Candlyn wanted more fire and brilliance, a more definite characterization of individual registers (particularly in the flue-work) and less tubbiness throughout. All the fine strings and other colors were untouched, but the mixtures were revoiced, new ones added, leathered pipes brightened by removing the leather, and the pitch raised almost to orchestral. "To quote Dr. Candlyn, "This became a Willis organ with all the brilliance of the French." Much of the actual revoicing took place on the job; Adolph Zajic was sent from Hagerstown to revoice the Tuba Mirabilis with entirely new tonuges. Möller rebuilt the Skinner console shell in their factory in Hagerstown, installing new ivories, 244 new silver contact wires, and a new solid music rack. New relay and combination action mechanisms were installed in the basement. The c.1913 Orgoblo, completely overhauled in 1943, was retained. While the organ was unplayable due to lack of a console, a two-manual Möller "Artiste" was loaned to the church. In 1945, the Ernest M. Skinner & Son Company was contracted to rebuild the 1913 Skinner Organ (Op. 205) with fairly extensive tonal changes drawn up by Dr. T. Frederick H. Candlyn, successor to Dr. T. Tertius Noble as organist and choirmaster. Changes included revoicing of the Great reeds along Willis lines, revoicing the Swell Double Trumpet and Clarion as Cavaillé-Coll reeds, replacing the Oboe with the Flügel Horn from the Solo, and replacing the Claribel Flute with a 4' Geigen. The Choir division was increased in tone, a Tierce and Septième were added, and the Piccolo was changed to a Nazard. The Solo received a new Orchestral Trumpet, and the Fagotto was revoiced and made available on the Pedal. Two 8' Flutes in the Echo were replaced with an 8' Diapason and 4' Principal to support congregational singing. The Pedal 16' Bourdon was eliminated and replaced by a Gemshorn rank (playable at 16', 8', and 4'), and the Great 16' Diapason was made available on the Pedal at 16' and 8' pitches. Skinner also made a number of mechanical improvements to the console. The original organ of the present St. Thomas Church was built in 1913 by The Ernest M. Skinner Company of Boston as their Opus 205. Dr. T. Tertius Noble, organist and choirmaster from 1913 until his retirement in 1943, began his tenure as the Skinner organ was nearing completion and became a close friend of Ernest Skinner. As the Skinner Company Fifth Avenue Studio was only a block away from the church, Mr. Skinner would bring visiting organists and other musicians to play and hear this showpiece organ. According to The Life and Work of Ernest M. Skinner by Dorothy J. Holden, Skinner's Op. 205 included the builder's first 32' Sub-Bass stop; in reality, the bottom octave of the 32' Diapason was stopped. Following the 1905 fire, plans were quickly prepared to erect a 1400-seat temporary wooden church within the ruins of the 1870 building. An altar and chancel furnishings were provided by the J. & R. Lamb Studios, and the Hutchings-Votey Co. lent an organ. As work progressed on the new church, the temporary church was removed and stored so that the foundations and nave floor could be built, after which the temporary church was reassembled on the new floor. Holes were poked through the roof of the wooden church when the nave piers were constructed. The temporary church was first used on All Saints' Day with a congregation of five hundred. The following specification was recorded in an organ notebook by Lynnwood Farnam (1885-1930), noted concert organist of the early 20th century. Farnam did not indicate manual and pedal compasses, so the following are suggested as typical of Hutchings-Votey organs of the era. The organ was later advertised (The New Music Review, May 1913:4) for sale, with a price of $3,500, by The Ernest M. Skinner Company. Great Organ (Manual I) – 61 notes? Pedal Organ – 30 notes? In 1904, Hutchings-Votey of Boston extensively rebuilt the organ to include electro-pneumatic action, but less than a year later, on August 8, 1905, the organ and church were destroyed by fire. From 1881-83, Hilborne L. Roosevelt returned to St. Thomas Church where he had worked 12 years earlier when the 1870 Hall, Labagh & Co. organ was installed. Roosevelt also devised a method of electrically ringing the ten Meneely tower bells from a small keyboard at the right of the organist. The description that follows is from a brochure that Roosevelt published regarding this work. Later sources state that the Choir Organ was enclosed (perhaps influenced by his approval of the Cavaillé-Coll organs he had examined while in France). On May 25, 1881, the RECTOR and VESTRY of ST. THOMAS' CHURCH, contracted with MR. HILBORNE L. ROOSEVELT to reconstruct and enlarge the organ on a plan or scheme by Mr. Roosevelt—in conjunction with the Organist of the Parish, MR. GEO. WM. WARREN. The specification amounted to a total rebuilding of the whole Instrument on the most approved plans—using (as the best organ builders do in Europe) fine materials, and all work being finished with a durability, strength and elegance unknown in the earlier organ work of this country, and bringing into requisition every appliance of modern invention and usage, only rejecting what was considered merely complex. The contract allowed three vacations (up to 1883) for completion of the specification, but Mr. Roosevelt has preferred to do two-thirds of the work this season, and by CHRISTMAS expects that nothing will be left undone but the SOLO ORGAN (4th Manual) and the 32 feet Double Open Diapason on the pedal organ. TWENTY-TWO of the Registers (or Stops) will be entirely new—including about 1,200 pipes, ranging in length from 32 feet to 3/4 of an inch. All other pipes to be made as good as new, and some better (for age mellows the tone of good diapasons) by revoicing and cleaning as necessary. Nearly all the immense amount of mechanism necessary for so large an instrument is also new, and the Key-box, with its four manuals and Fifty-five Sounding Registers (and no half Stops) is a marvel of beauty in appearance and ease of manipulation. The Manual Organ (including the Great, Swell and Choir Organs) has been removed to the South Side of the Chancel (that organ chamber having more space than the other). The Key-box, with Organist's Seat is necessarily raised to permit the removal of all action work from the basement (as in the old arrangement). The Chamber on the north side contains the Pedal Organ, and will receive the Solo Organ (4th Manual) in due time. The two organs are connected by tubular action (compressed air). The Great and Swell Manuals and the pedals are supplied with the pneumatic lever. The Solo Organ will be connected to the keys by an electric and pneumatic action. The Couplers are manipulated by Thumb-knobs between the different Key-boards. The Great, Swell, Choir and pedal organs are on 3½-inch wind pressure. 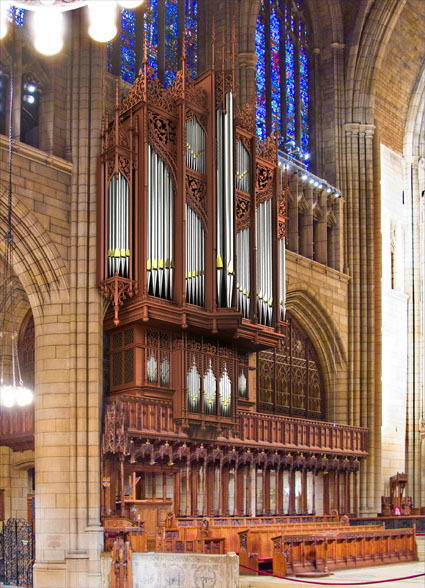 The Solo Organ will be on 8-inch pressure, and in addition to the Keraulophon,—Flutes (2) and Vox Angelica, will contain a BOMBARDE ORGAN (Three Grand Trumpets) of 16, 8 and 4 feet Register. The bellows have been made very ample, with extra reservoir, and so arranged as to be worked by engines, whenever decided upon. This slight and imperfect description of a very great work, with the following schedule is issued in answer to numerous inquiries. In 1870, Hall, Labagh & Co. of New York City built a new three-manual and pedal organ for the new St. Thomas Church on Fifth Avenue and 53rd Street. The organ was divided and placed behind pipe screens on two sides of the chancel: the console, Great, Swell and Choir divisions were on one side and used Barker pneumatic assistance, while the Pedal was located on the other side of the chancel and controlled electrically with a system devised by Hilborne L. Roosevelt, then an employee of Hall, Labagh & Co. Provisions were made for a Solo organ to be added at some future time. An entry in the Hall & Labagh ledger book notes that the organ cost $10,000. Following the fire of 1851, Hall & Labagh of New York City were contracted to provide an organ for the new St. Thomas Church. The case, designed by Wills and Dudley and painted to imitate oak, was 27 feet high, 17 feet wide and 10 feet deep. When the church relocated to Fifth Avenue and 53rd Street in 1866, the vestry planned to move the organ, but in the end decided to have an entirely new organ built by Hall, Labagh & Co. The 1851 organ was placed in storage until it was sold as a temporary organ for the new Steinway Hall at 14th Street and Fourth (Park) Avenue. The temporary organ remained in Steinway Hall until both were demolished in 1925. We were highly gratified last evening in witnessing the opening of the superb Organ recently put up in St. Thomas Church, by Mr. Erben, the builder. This magnificent instrument is the largest ever built or used in the United States, its case is 35 feet high, 18 feet 6 inches wide and 11 feet deep, it contains 28 stops, has 3 sets of keys, and Pedal Bass; the number of pipes contained in it are 1700, the largest pipe is 22 feet long and 21 by 18 inches calibre [sic], equal to 57 cubic feet; the case is superbly finished in the Gothic order, and the tones of the instrument say the least of them, we think have not been excelled by any other in this country. Several eminent musical professors attended on the occasion, to try the organ; and a highly respectable audience enjoyed a great treat in hearing it touched in a manner which, while it did justice to the high finish of the instrument, was highly honourable to the musical talent of our city. We feel assured we only speak in accordance with the feelings of all who have seen and heard this instrument, when we say, that Mr. Erben has done himself great credit in making and erecting it. The organ and church were destroyed by fire on March 2, 1851. According to the Henry Erben opus lists, his firm provided an organ in 1825 for the first St. Thomas Church edifice. Church records show that an organ was rented for $500. This organ was replaced in 1831 when a larger Erben organ was installed. The 1825 Hall & Erben organ was sold to St. Clement's Church in 1831, and was later sold to the Free-Will Baptist Church in 1866. Blanchard, Homer D. "The Organ in the United States: A Study in Design", an article in The Bicentennial Tracker. Richmond: Organ Historical Society, Inc., 1976. Boston Organ Club Newsletter? (date unknown). Specification of Henry Erben Organ (1831) - actually the Hall & Erben Organ (1825) as installed in the Free-Will Baptist Church. Courtesy Larry Trupiano. Callahan, Charles. The American Classic Organ - A History in Letters. Richmond: The Organ Historical Society, 1990. Aeolian-Skinner shop notes dated October 12, 1955. Dobson Pipe Organ Builders, Ltd. website: http://www.dobsonorgan.com/ Specifications of Op. 93. Farnam, Lynnwood. "Organ Notebook," Specification of Hutchings-Votey organ (1907) in the temporary wooden church. John de Lancie Library, The Curtis Institute of Music, Philadelphia; Sally Branca, Archivist. Courtesy Jonathan Bowen. "G. Donald Harrison, Manufacturer, Dies; Noted Designer of Pipe Organs Was 67," The New York Times (June 16, 1956). Goldsworthy, William A. "Dr. Candlyn & St. Thomas," The American Organist (June 1949). Specification of M.P. Möller Organ, Op. 7900 (1948). Hall, Labagh & Co. Account Ledger Book (1868-1873), pages 195, 204 & 235: cost of 1870 organ is $10,000. Courtesy Larry Trupiano. Musical Courier and New-York Enquirer, June 18, 1831. Article about Henry Erben Organ (1831). Courtesy Larry Trupiano. The New Music Review (August 1913, Vol. 12, No. 141):268. Specification of Ernest M. Skinner Organ, Op. 205 (1913). The New Music Review (May 1913, Vol. 12, No. 138):4. Ernest M. Skinner Company Ad for Hutchings-Votey Organ (1907). Ogasapian, John. Organ Building in New York City: 1700-1900. Braintree: The Organ Literature Foundation, 1977. Specification of Hall & Labagh organ (1851-52). Roosevelt, Hilborne L. "Description of the Organ of St. Thomas' Church, New York, as Rebuilt and Enlarged by Hilborne L. Roosevelt." Courtesy Larry Trupiano. Self, William. For Mine Eyes Have Seen. Worcester: Worcester Chapter of the American Guild of Organists, 1990. "Stop, Open and Reed – a Periodical Presentation of Pipe Organ Progress". Boston: Skinner Organ Company, 1922-1927. Trupiano, Larry. Console details of Aeolian-Skinner Organ, Op. 205-A (1956). Webber, F.R. "Organ scrapbook" at Organ Historical Society Archives, Princeton, N.J.; courtesy Jonathan Bowen. Cites New York Musical Gazette (Nov. 1874, p.358) regarding H.L. Roosevelt devising way to electrically play the ten Meneely bells in the church tower. Wright, J. Robert. Saint Thomas Church Fifth Avenue. New York: William B. Eerdmans Publishing Company and Saint Thomas Church Fifth Avenue, 2001. Bowen, Jonathan. Hutchings-Votey brochure photo of 1904 organ. Callahan, Charles. The American Classic Organ - A History in Letters: Console of Aeolian-Skinner Organ, Op. 205-A (1956). deZanger, Arie. St. Thomas Church exterior. Dobson Pipe Organ Builders, Ltd. website. Rendering of new organ case for Dobson organ, Op. 93. Kidder, Frank Eugene. Churches and Chapels. New York: William T. Comstock, 1906. Hutchings-Votey Organ (1904). Lawson, Steven E. Pipe display on left (Liturgical North) side of Aeolian-Skinner Organ, Op. 205-A (1956). Rust, John. Case of E.M. Skinner Organ, Op. 205 (1913), from below (color). St. Thomas Church Fifth Avenue. Interior with Roosevelt organ; interior of temporary wooden church with Hutchings-Votey organ. Scofield, Jeff. Photo (1996) of Aeolian-Skinner organ	console. "The Skinner Organ," booklet published by Ernest M. Skinner Company. Case of Ernest M. Skinner Organ, Op. 205 (1913). Courtesy John Rust. Stein, Ken. Console and case of Aeolian-Skinner Organ, Op. 205-A; rev. (color). "Stop, Open and Reed – a Periodical Presentation of Pipe Organ Progress". Boston: Skinner Organ Company, 1922-1927: case of Ernest M. Skinner Organ, Op. 205 (1913).